It’s that time of the year when people start asking what plans everyone has for the holidays, and as usual we have barely found a spare moment to discuss it, let alone book anything. We have a few nights locked in on a farm in the Southern highlands, I tell people, eliciting the next question about what there is to do there. That's what we like to do on holiday, a whole lot of nothing. Not that it is easy: doing nothing requires a bit of planning and usually a fair bit of driving. So while others are dreaming of trips to galleries, museums, ancient temples, theme parks and ski fields, we scheme ways to reach really remote, wide open places, perhaps with a solitary tree for some shade. We've got the kids into it too, and they are now really good at playing with nothing, or at most not very much. 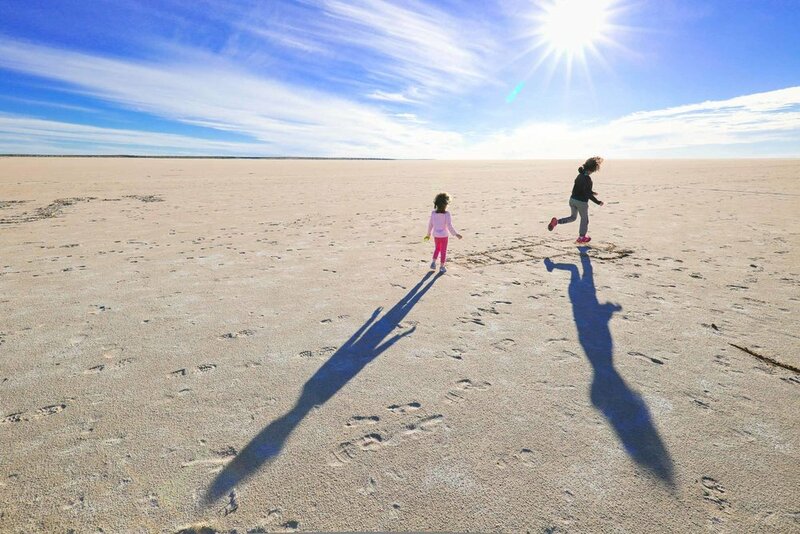 One of the first times we saw this happening was on a whimsical trip we took to Lake Eyre to find the fabled water that rarely flows into this outback depression. We didn’t have much time, so we had clocked up fair few solid driving days before arriving at the shore of this vast expanse, from where we could see vague hints of moisture about 5 desolate kilometres away. Between us and what may have been water in the distance there was only the retina searing brilliance of caked salt, but the kids didn’t care - fun could be had, even here. At first the salt itself was a source of entertainment and of course it had to be tasted to check that we weren’t lying about what they were walking on. Then, once sticks were located, the integrity of the ground surface had to be tested by jabbing and prodding at it, digging holes and generally enjoying being able to vandalise the huge canvas they had found. Then from the sticks evolved games: hopscotch was etched into the pan and trails were carved that had to be followed or else. And when they tired of all that, they ran wild, free, far and unobstructed, delighting in the sheer nothingness of this wild place. The next day there was nothing else for it, we had driven all this way to a place of great emptiness, so by heavens we were going to be in it. Heading out just far enough to find a wide open space, we parked, let the kids out and before we could unfold the camp chairs they had invented a game. Shops and houses were drawn out in the baked earth, wildflowers became a form of currency and the traders were open for business by the time the billy had boiled. And if disputes arose, their playground was big enough for one party to wander off and while away the time examining seed pods, insect burrows and special rocks. The kids are never bored when they have nothing to do in the wild, because their days are filled with exploration and discovery and games of their own invention. It's the perfect antidote to busy lives in the digital age, not just because it's unstructured, but also because it's so tactile. A cluster of artesian mud puddles may not appeal to most, but for us it was a no brainer on a recent trip to outback Queensland. As soon as the kids reached their ill-defined, soggy shore, they immediately asked to take their shoes off. Soon their long pants were piled up too and off they went, dragging sticks through the goo to make patterns, and delighting in feeling the mud squishing between their toes. A ten minute break soon became an hour-long stop, as they took in every source of stimulation they could find in this rich, wide space. 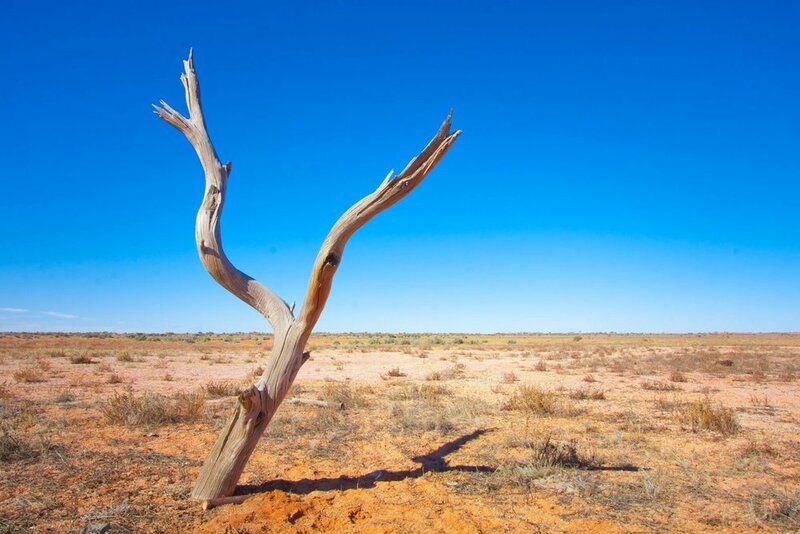 After overcoming the challenge of getting them to agree to leave, the next hurdle was making sure they didn't bring half of Queensland's artesian basin into the car, but it was their problem to solve. With not much at their disposal, their found a nifty way of removing wet mud from their feet with dry sand. When you are nowhere, doing nothing, relationships are built: your eight year old comes and tells you stuff; your five year old learns how to dig a hole and do a poo in it and cover it up and clean up her hands; and your 12 year old turns up for a cuddle. In summer, when the desert is too forbidding, we head into the mountain country. When everyone crowds the beaches, it is astonishing how many beautiful lengths of river exist without a soul in sight other than those that you love. On the road to nowhere you meet lots of people. Generally, they’re pretty good ones. All kinds of friendships are sealed, many of the best ones not lasting longer than it takes for the fire pit to cool. But when you get to nowhere, you meet no-one. That’s when you get to do nothing, in the great, soul-enlarging, big empty.